Maneuverability has never been more stylish. 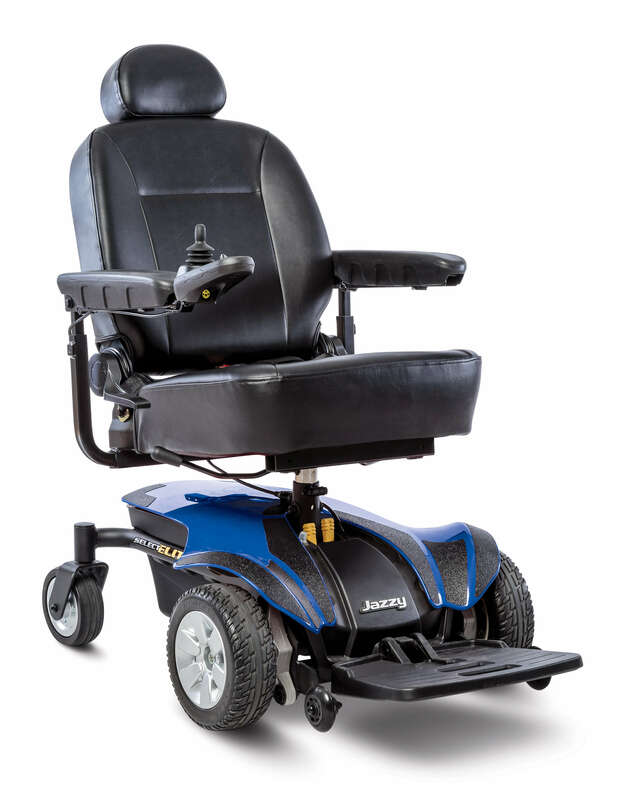 The Jazzy® Select Elite features in-line, front-wheel drive technology for maximum stability. Enjoy a tight turning radius around corners and handle obstacles and grade changes with ease, both indoors and out. At MobilityWorks our goal is to make sure that we have assisted you in selecting the right solution for your needs. However, we are aware that sometimes this goal may not be achieved, and a need to return an item can arise. Should there be an issue with the quality of an Assistive Device (motorized scooter, wheelchair) received from MobilityWorks, and it is determined that the product is Defective, MobilityWorks provides a one-year warranty covering the full cost of repair or replacement of the product . Please contact INSERT NAME OF CONTACT should you need further assistance. Arrangement of, and the expense associated with, freight to return the product is the responsibility of the customer unless there was an error by MobilityWorks that is noted in the Return Authorization. If there is an error (ie. incorrect or defective product), MobilityWorks assumes responsibility for the arrangement and expense of freight. In all other instances it is the responsibility of the customer. MobilityWorks staff will assist and advise customers in efficient methods of returning the product. It is highly recommended that larger items and larger dollar amount items are to be insured, at the expense of the shipper, for their full retail value against shipping damage. Should shipping damage occur, it is the responsibility of the customer to file a claim with the shipping company. Should an order be canceled by the customer after the product(s) has been shipped, the order is subject to the MobilityWorks Return Policy. The client must accept delivery of the product, obtain a Return Authorization Number from MobilityWorks and coordinate return shipping of the product to MobilityWorks. If an order is cancelled after the product(s) have been shipped and the shipment is refused by the customer all expenses associated with the refusal and return freight will be deducted from any credit to the customer’s account and a 25% Restocking Fee, or minimum $50 (whichever is greater), will be applied. Express (2nd Day or Next Day) shipping costs will not be credited if delivery is refused. Upon receipt of the returned product(s) and verification of the applicable Return Authorization Number MobilityWorks will inspect the product(s) for compliance with the Return Policy. If in the sole judgement of MobilityWorks’ staff the product(s) are in compliance with the Return Policy, MobilityWorks will issue a credit to the credit card used for the purchase. Due to credit card processing, please allow up to 4 weeks for the credit to be processed by the credit card company. If the product(s) were paid by check or money order, MobilityWorks will issue a check within 30 days. Completing a Request for a Return Authorization does NOT guarantee acceptance of request by MobilityWorks. Request must comply with MobilityWorks Return Policy and is subject to conditions thereof. Restock Fees do apply to certain products. Please see the MobilityWorks Return Policy for details. Products must be returned to MobilityWorks in original packaging. Returns must be submitted within 30 days of delivery. Returns older than 30 days will not be authorized. Products not eligible for return will not be issued an Authorization Number. Please see the MobilityWorks Return Policy for details. Sign-up Today to Receive our Latest Promotions, News & Events!